I am pleased to let you know that Terminal 5 continues to perform well. In May, 80% of our customers told us they had to wait less than 5 minutes to check-in. Customers also said they were highly satisfied with how quickly baggage arrives on the carousel. Note that they are not saying that it takes their customers less than five minutes to check in; they are saying that their customers are saying that. Nor are they attributing an emotion or judgement to the customers. BA is, instead, accepting that a (presumably) objective fact becomes more credible if it is asserted by customers than when it is asserted by themselves. That's something worth bearing in mind when designing services where customers' propensity to use them is in part a function of what they understand other users' opinions of the service to be - and that must be pretty much all of them. The Innovator's Dilemma is a book, published just over ten years ago, the central argument of which is that it is very hard for dominant firms in a market to innovate radically, because by doing so they risk destroying their existing business. If they don't, though, they make themselves vulnerable to some upstart which doesn't need to worry about the past and which invents a new way of doing things -and so the original company gets destroyed anyway. Which is what makes it a dilemma. The first example explored in the book is the development of computer hard disks - from the earliest refrigerator-sized 5Mb disks onwards. To oversimplify horribly, at each stage of significant and disruptive technical innovation, new entrant firms dominated the new technology, leaving the established firms of the previous generation to keep squeezing performance out of the earlier technology. But now along comes the most disruptive challenge to the hard disk industry of all. For the last fifty years, hard disks have been increasingly super-charged gramophone records: at their heart, there is still a real disk rotating very fast on a real spindle. That's not the only way to store data, as the memory stick revolution shows, but until now, solid state drives (which have no moving parts) have been too small and expensive to replace traditional hard disks as the main storage device for a computer. Now that's changing, with real advantages for users as a result. Seagate's response is to threaten to sue all the new entrants for patent infringement, while insisting that their existing market is not threatened. 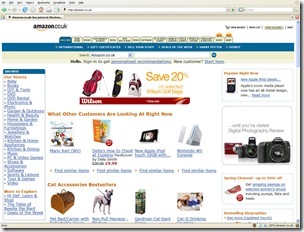 Amazon is implementing a new design for its site. At least I think they are - there is no announcement, no razzmatazz. But there is a new design which at first sight is a more radical change than they have done for a long time - the navigation tabs across the top have been replaced by cascading menus down the side. For a public strategist, the interest is less in the redesign as such though, much more in the manner of its appearance. The second has not yet replaced the first, but it is replacing it. 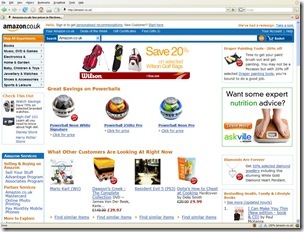 Amazon is presumably managing this gradually, serving the new pages to a proportion of users which they can gradually turn up as their confidence in the new site grows - or if there are problems, they could revert altogether to the old one without most of their users ever knowing that there was even a potential problem. There is, in any case, no such thing as the Amazon home page. Not only are there the personalised versions which logged in users see, there is a set of pages aimed at people Amazon does not know, presumably served randomly. A couple of days ago, there were at least five (a simple refresh pulls up a different one each time). Having multiple home pages allows, of course, a constant exploration of their customers' views in a way which would not otherwise be possible - which products, displayed in which ways, are most likely to entice the potential new customer on to eventual purchase? Both these features show a way of thinking about managing change which is still troubling for many in the public sector. How can more than one version be current at the same time? How can we show something different to one user from what we show another - and how can that not constitute some obscure form of unequal treatment? In quite a subtle way (or at least more subtle than most of the ways this becomes apparent), this is yet another symptom of a supplier-based view. The single version of the truth is only a good thing if the unitary nature of the service is more important than the heterogeneity of service users. If the single version of the home page meets your needs better than mine, the supply-side mentality sees us as being treated equally; but from a customer perspective, you have something which suits you and I do not - which doesn't feel very equal at all. As customer service becomes more customised in other contexts, this is going to be an increasing challenge for public services. Directgov has implicitly recognised this by the existence of its separate kids' site - but even that serves as much to highlight the problem as to address it: it says it is aimed at 5 to 11 year olds (though I can't see many at the upper end of that range having much truck with it) - but where does that leave 13 year olds, or 83 year olds for that matter, who join the rest of us in being expected to use the main Directgov site? That's not a dig at Directgov, who are doing a lot of good work with and about their users - this is a challenge for every service and every means of delivery about how we really put the social into media. Governments don't tend to go out of business - at least not in the way in which private sector companies do. But nor are their service delivery models preserved indefinitely in amber. The music industry has transformed itself into a comic soap opera, providing huge entertainment from its fundamental misunderstanding of the world it finds itself in. That is a fate better avoided.